Second thoughts like: How am I going to do this? I’m a Latina from a humble family; will I fit in? Can I handle the workload? Will I get lost? Eating breakfast in a noisy dining hall at the University of Notre Dame the following week, in late June, Betty had regained her trademark cheerful composure. The aspiring neurologist had already conquered a week-long college course in medical research at Brown University in Providence, Rhode Island, where she delighted in dissecting fruit flies and flatworms. Now, she was dipping her toe into the second: a two-week immersion in astronomy at Notre Dame, where she was geeking out over decimal points of mass, force and inertia, and dragging herself out of bed for nighttime stargazing. In less than two weeks, Betty had traveled 3,000 miles, navigating big, confusing airport terminals and hailing shuttles and cabs by herself. The girl who’d never spent a night away from her parents had cracked the codes of campus maps, zigzagging from dorm rooms to classrooms. She was up early, busy constantly and totally on top of her studies. OK, so there were some little stabs of homesickness. But they softened in the tumult and triumph of her summer college experiences. Top high school students have long ventured onto campuses across the country in the summer to get a taste of college life and real college coursework. While those trips have been a staple of affluent families’ college-prep agendas, many high schools and colleges are trying harder to include students who might need a bit of extra help in planning for college and adjusting to campus life: those like Betty, with little or no history of college-going in their families. Many summer programs aim to build weak academic muscles, to help students avoid the remedial classes that can slow or stall their college progress. Others, like the ones Betty attended this summer, are designed to let academic stars soar. Both kinds of programs also aim to nourish teenagers’ college aspirations and plans and give them early practice with the time-management and self-advocacy skills that can sink some freshmen. Research shows that summer programs can boost the chances that students will apply to, and enroll in, college, that they’ll perform better when they get there, and that they’ll be less likely to bail out after their freshman year. Students who attend summer programs are more likely to have good study skills and more faith that they can handle college. “Doing better academically can be influenced by having more confidence, a familiarity with campus life,” said Elisabeth A. Barnett, who’s studied the transition to college as a senior research associate at the Community College Research Center at Columbia University. “Getting that experience early, with the support of people who are helping you find your way, can be particularly important for students who are the first in their families to go to college,” she added. Betty will be the first in her family to earn a bachelor’s degree and the first to leave home for college. Her resume shows she’s been getting ready: a 4.0 grade point average at her high-flying charter school, IDEA College Preparatory, in Mission, Texas. Five Advanced Placement classes finished and five more on the runway. She also tutors for the National Honor Society, volunteers at the library, and plays Spanish classical guitar. But a tangle of worries buzzed in her head as she got ready to board a plane for Brown. There were the universal ones: Would she make friends? Would she be able to find her way around? Betty is troubled, too, by the feeling that she’ll be abandoning her family responsibilities when she goes away to college. She helps take care of her older sister, who has autism. She makes sure her baby sister is dressed and her younger brother gets off to school. Who will do those things when she goes away? “Betty understands how the trajectory of her family’s life may change with her seeking a higher education,” said Arianna Robles, the college counselor at Betty’s high school. Betty’s father, Antonio Torres, wishes he could vaporize those worries. Sure, he and his wife, Beatrice, haven’t exactly rested easy since Betty left; they were worried sick when she missed a shuttle connection to campus and caught a ride with someone she barely knew. They constantly check their cellphones for updates, even though dutiful Betty calls daily. But they’re getting used to this new reality and don’t want it to hinder their daughter’s college dreams. “She told me, ‘Oh, maybe I shouldn’t go,’ and I told her, you need to go for the best you can be. You’ll never know what you could be if you don’t go for it,” Torres said. She helps take care of her older sister, who has autism. She makes sure her baby sister is dressed and her younger brother gets off to school. Who will do those things when she goes away? That’s the message Betty’s been getting at her school, too, since sixth grade. The IDEA charter school network, which serves 24,000 students in 44 Texas schools, takes a “white glove” approach to college counseling. With a 30-to-1 student-counselor ratio, the college-mindset drumbeat starts early and grows louder as students progress through school. Betty Torres strums a guitar in her bedroom in Mission, Texas. Looking on, from left to right, are cousins Krystal Santillan and Alessandra Jaimes and Betty’s sister, Samantha, who is seated. 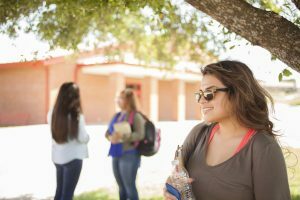 Overall, IDEA charter students apply to schools that are a good academic match for them, but a common speed bump arises from their Rio Grande Valley demographic, said Sari Wilson, the director of IDEA’s Collegiate Summer Away Program. “Since most come from a rural area, our biggest push is to get them to actually enroll and set foot on campus,” Wilson said. “Often, they don’t feel comfortable, like they belong.” Summer programs can show the students “that they can and will succeed if they go to those schools,” she said. Betty’s experiences at Brown and Notre Dame have shown her that she certainly can feel at home in the halls of academia; she’s done well in these credit-bearing classes. But they’ve also shown her how much a university’s style and student population can make a difference in her sense of belonging. At Brown, she was part of a stew of young people from many walks of life and racial and ethnic backgrounds. The university’s various clubs held “workshops” to give the teenagers a taste of campus life. Betty was dazzled by the discussions about politics and values, Brown’s freewheeling energy, its celebration of multiculturalism. At Notre Dame, she felt a little out of place, with few nonwhite faces around her. She loved the challenge of her astronomy class and enjoyed the nonacademic parts of the program, too, such as a visit to a nearby residential program for students with special needs, where all the young people shared pizza and karaoke. Betty found Notre Dame’s students and staff friendly, but she didn’t feel she clicked as well with the university’s more structured, reserved sensibility. It’s clear that the two contrasting experiences are seeping into her college thinking. A diverse student body will also be very important to her, she said. Paulette Curtis is intensely aware the role diversity plays in prospective students’ thinking. As the supervisor of Notre Dame’s pre-college programs, she is working to include more minority, low-income, and first-generation students. She knows the $3,400 price tag of the Summer Scholars Program, which Betty attended, keeps many high-achieving, underrepresented students from walking through the door. Notre Dame can afford full or partial scholarships for fewer than 50 of the 300-plus high school students who do two-week dives into global health, poverty, Russian literature, archaeology and other topics here during the Summer Scholars program, she said. Outside organizations finance the cost for only a few more. It pains her, because she believes programs like this provide a powerful kind of college preparation, especially for students whose families or high schools can’t. Betty agrees enthusiastically that she experienced those things this summer. And she said they enriched and expanded her world and made her feel more ready to travel far from home as a college student a year from now. This story was produced by Education Week, a nonprofit, independent news organization with comprehensive pre-K-12 news and analysis. Read the original post here. 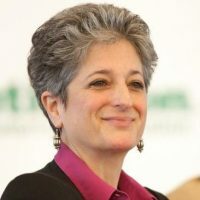 Catherine Gewertz is an associate editor for Education Week. She covers assessment and pathways through middle and high school. She is the author of the blog High School & Beyond.